There are certain things that must be kept, infant momentos, art projects, school photos, report cards, achievement awards, etc. You’ll probably want to build one box for each child or grandchild. You don’t even need to tell them. Then at some future date, when the kids become adults, let them have the box full of treasures. 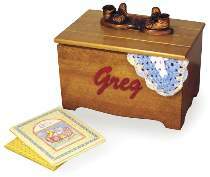 They will really enjoy seeing what you’ve put away and they will have a lifelong heirloom keepsake box to remember you by. All patterns drawn FULL SIZE. Measures 11-3/4"H x 19-1/2"W x 13"D. Order hardware separately below.